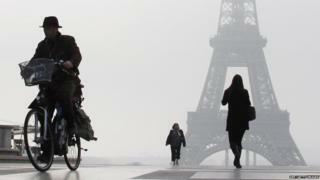 Cyclists in Paris are to be allowed to ride through red lights after tests showed the move would not lead to accidents. Traffic lights for bicycles will be placed under the traffic lights for cars on some junctions. The lights will indicate when bikes can either turn right or ride ahead - even when lights for cars are on red. Paris, blighted by smog this year, is keen for more people to take to their bikes throughout the city. The mayor's office says (in French) the scheme will be rolled out on some crossroads across the French capital from July to the end of September. The change would "help improve the flow of cycle traffic", the statement said. Tests held in 2012 found that allowing the cyclists to move more freely cut down the chances of collisions with cars, including accidents involving the car's blind spot. Where there are no traffic lights for cyclists, they must respect the main lights. Despite the move, cyclists would not have priority on the roads and must cede to pedestrians and other road users where necessary. Paris is looking to triple the amount of bicycle journeys in the city by 2020 - ensuring people use bikes for 15% of all journeys. A city-wide network of bike paths will be created, and up to 10,000 new parking spaces for bikes will be installed. In March, Paris restricted the amount of cars on the road because of a sudden increase in air pollution. Electric or hybrid vehicles were exempt from the restriction.